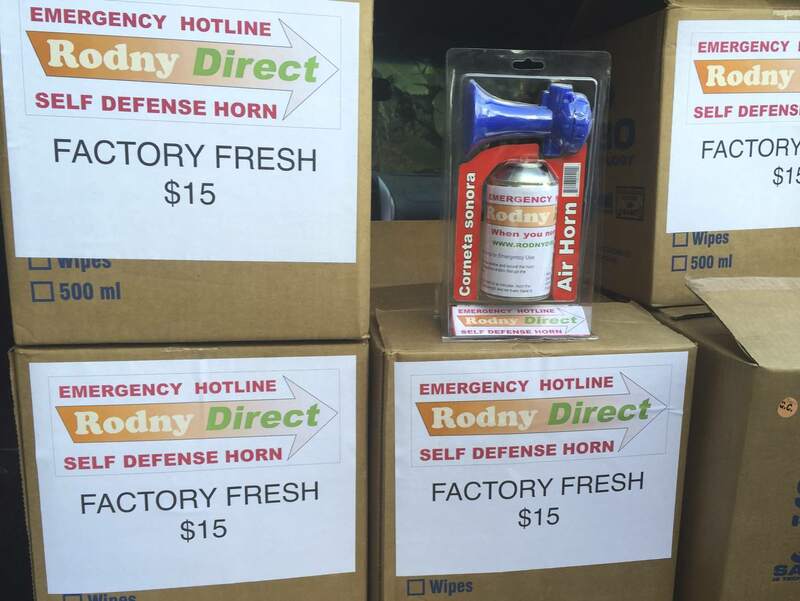 Self defense horns, (AKA boat horns and air horns), are one of the cheapest and best non-lethal tools for disrupting and potentially diverting a home invasion robbery. Go to your neighbors and show them the horn. Demonstrate it for them - outdoors of course. Instruct them that when they hear this noise, respond in whatever way is agreed upon - call Rodny Direct, possibly come over to investigate. Unlike most alarm systems, it will never make a false alarm. Have it available near your bed so you can reach over and grab it when you hear a possible intrusion. The instant you can verify that an intrusion is under way, take the horn to a window, open the window and fire off three 2-3 second blasts. This will wake up everyone for a kilometer around and in all likelihood will stop the intruders in their tracks. Then follow your pre-determined self-protection plan - jump out the window and escape, retreat to your safe room, or whatever you have determined to do. In the event that the intruders have gotten into your house before you know they are there (NEVER let this happen), you can use the horn like a gun - point it at them and fire away. It will be extremely disorienting and will give you precious seconds to escape. How many do you need in any one house? It would be a good idea to have one in every area where you spend time - certainly the bedroom, but also in the TV room (many home invasions take place while the residents are watching TV), your office, car, etc. 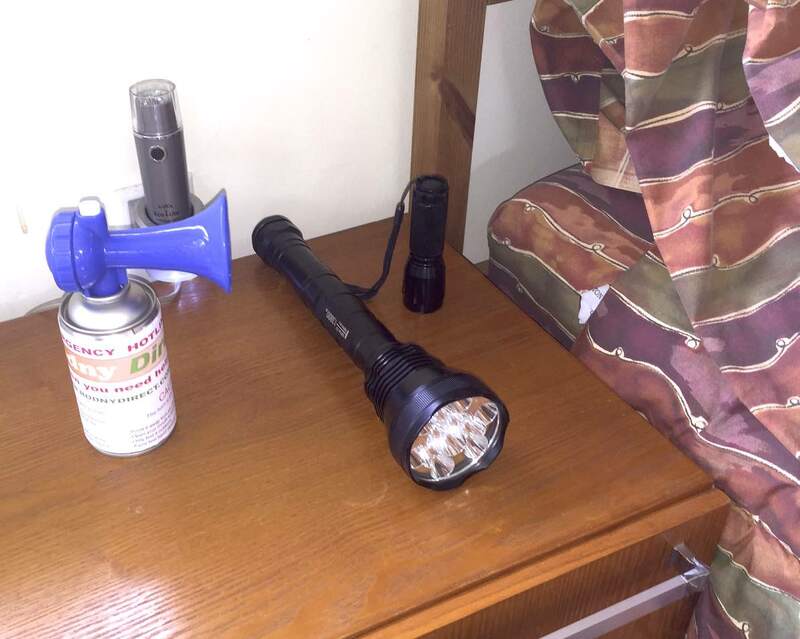 A well equipped bedside table: Horn, huge flashlight for investigating/blinding/scaring and possibly clubbing; small flashlight for power outages and backup power outage flashlight. When checking out suspicious noises in or around the house, carry the big flashlight in one hand and the personal protection horn in the other. There are really two questions: How much firing time is there in a can, and how long will a can last if not used. 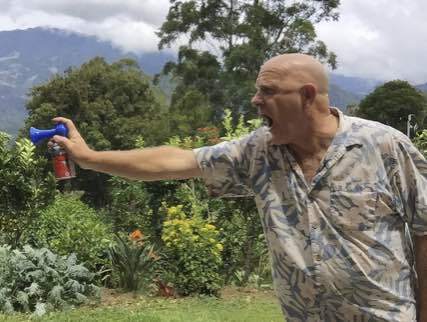 Your milage may vary, but a can should be good for 40 or so two second blasts. Left on the shelf, some cans of gas will slowly leak out over a year or two, others will hold gas forever. If you can feel the liquid in the can (actually liquid butane) sloshing around, it should be good to go, but it is a good idea to do a quick test firing every now and then. What is the correct shooting technique? Hold the horn out at arm's length (pointed away from you of course) and open your mouth, which will equalize the pressure on your eardrums and avoid hearing damage. Make a series of short blasts, maybe 1-3 seconds to alert the neighbors.